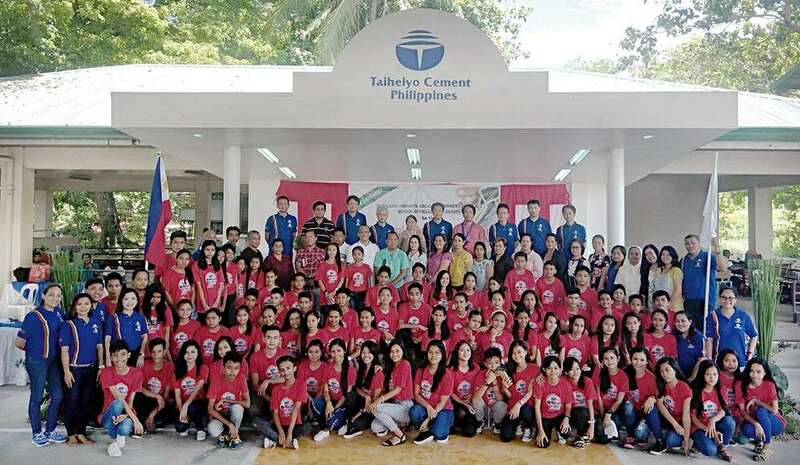 THE scholarship program of Taiheiyo Cement Philippines Inc. (TCPI) continues to expand in collaboration with Solid Earth Development Corp. (SEDC). As TCPI saw its first set of 11 senior high scholars graduate early this year, it took in 13 new scholars who have started in Grade 7 and three more college scholars with SEDC starting to sponsor its own college scholars. The scholars are from San Fernando in southern Cebu where TCPI is based. During the 14th annual scholarship ceremonies, TCPI honored the latest college scholars who graduated. TCPI hired two graduates. Two others have been guaranteed employment after passing the board examinations. The company also honored 17 of the 80 current scholars who earned high honors last school year with 47 others who also finished the year with honors. TCPI president and chief executive officer Kazuhiko Ichizawa and SEDC senior technical adviser Taro Sumi led in honoring the scholars and in welcoming the new batch at the TCPI multipurpose recreation center with their families and community leaders. Ichizawa took pride that TCPI has been hiring its own scholars. “We already have 11 scholars working with us, who are doing important functions, continuously developing their skills day by day,” he said. For his part, Suma recognized the daily struggles of the scholars. “As you worked so hard and overcome difficulties, you will change for the better. I hope that you will continue to advance and improve yourselves,” he said. While hard work is a given in school, Ichizawa’s successor as senior vice president (SVP) and plant manager, Chiyuki Sugawara advised them not to be afraid of failures but of doing nothing. “Challenge yourself with various things, whether you succeed or fail. If you succeed, you gain confidence in yourself. If you fail, then make it an opportunity to grow,” he said. Scholar Lyxen Marcos Fano completed Bachelor of Science (BS) in Financial Marketing at the University of San Jose–Recoletos (USJ-R), and got hired to join the TCPI sales logistics team. TCPI also hired Ted Frances Canonigo Servano, a scholar since high school who finished Bachelor of Arts (BA) in Communication also at USJ-R as community relations coordinator. Rhendi Catulpos also completed BS Mechanical Engineering at USJ-R and Mary Luchille Lapuz, BS Mining Engineering at Cebu Institute of Technology–University (CIT-U). They were assured of employmen by TCPI and SEDC after passing their licensure exams, according to Vanessa Bongcawil, the TCPI community and general affairs section head who handles the scholars. The three other senior vice presidents of TCPI—Takashi Miyashita for marketing, Shigeki Koide for human resources and administration with legal and corporate affairs, and Jun Koizumi for finance—joined in the distribution of certificates of scholarship. The three new college freshmen include Karla Tagimacruz Castillo, who was among the 11 senior high school scholars who just graduated. They are now taking up BS Accountancy along with Honey Kim Cañas Caño at USJ-R.
Cristian Boy Vallespin Delposo is now taking up BS Mechanical Engineering at CIT University along with the first SEDC college scholar Aison Tangente, who took BS Mining Engineering. The new 13 scholars entering Grade 7 include Sheina Marie Cantil, Cristine Marie Genilla, Rhianne Jane Fuentes, Divine Grace Racoma, Jholia Allyza Mangubat and Lhyn Angel Tapales. The other scholars are Romie Bayeta, Jr., Jewel Flores, John Edmar James Enardecido, Nathaniel Dimpas, Shylen Mae Geralde, Kimberly Jean Auman and Princess Jean Ongcoy. TCPI and SEDC started to grant scholarships in 2005 to those who graduated valedictorian in elementary school. They expanded the program in 2009, granting college scholarships. At least 170 scholars have benefited from the generosity of TCPI and SEDC.